DETROIT TIGER STADIUM DIAMOND picture photo art prints photograph for sale. 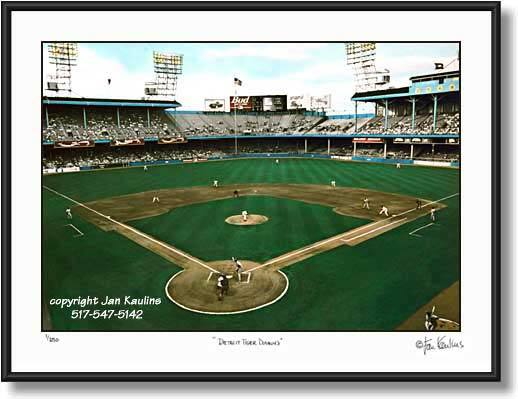 Old DETROIT TIGER STADIUM photo picture photograph print photo art pictures photo prints for sale This historic old Detroit Tiger Stadium picture photo print for sale is a wonderful historic vivid color photo made from an original black and white photograph that was hand colored by nationally recognized artist/photographer Jan Kaulins. This historic old Detroit Tiger Stadium action game picture photograph was taken during the final playing season at the old Detroit Tiger Stadium in The City of Detroit, Michigan, in the summer of 1999. This Detroit Tiger Stadium photo is a picture taken from the upper deck behind home plate during one of the last games at old Detroit Tiger Stadium. In this Detroit Tiger Stadium picture photo you are looking out to the center field flagpole and the bleachers. Also, in this historic Detroit picture photo is pictured the entire Detroit Tiger Stadium baseball diamond with players poised waiting for the pitch to be thrown. The richness of this original DETROIT TIGER STADIUM Limited-Edition artistic Fine Art hand-colored photo captures the action at old Detroit Tiger Stadium. This Tiger Stadium picture photo is one of the last pictures or photos taken at the old ballpark at Michigan and Trumbull in The City of Detroit Michigan.